Friday Summer Nights 2015 Program was an overall success that was made extra special by the personal connections made during the events in East and West Oakland. The Friday Summer Nights events were hosted at Willie Wilkins Park on 98th Ave. in East Oakland and at the corner of Market and San Pablo at 3233 Market Street in West Oakland. Youth hired this summer, through a grant from the Oakland Fund for Children and Youth (OFCY), formed bonds with each other as a cohesive unit. These bonds spread throughout the community, with neighbors meeting for the first time, exchanging information and returning the following week to socialize and share in the spirit of community. Thank you to the organizations that participated at the parks program this summer. These organizations are deeply rooted in community efforts to foster neighborhood unity and share resources through their networks. Oakland Fund for Children and Youth – Thank you for the generous grant. Through this grant we hired our youth leaders, case managers, and site coordinators for both parks this summer. Youth at the parks had access to case managers on site who worked closely with them all summer and connected them to additional services and support. First 5 Alameda County – Thank you for the fully loaded back to school backpack giveaway. Oakland California Youth Outreach – Thank you for joining us again this year and having Street Outreach Workers participate and connect with our youth during the summer events. Oakland Zoo – Thank you for all the free Family Park Passes to the Oakland Zoo. Once again, the families that won the tickets in our raffles were excited to have the opportunity to take their kids to the Zoo. 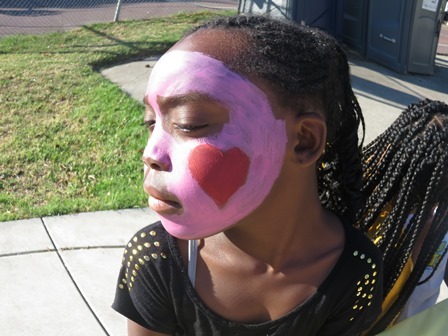 Attitudinal Healing Connection – Thank you for hosting our mural project and face painting at our West Oakland site. Additionally we want to thank the following organization for providing the following services; drumming and stencil art by Talk of the Town, logistical support by Jason Wallace of the YMCA, sports and diabetes training by DASH Camp, basketball support from OPR, book giveaways sponsored by East Bay Book Project, logistical and funding from the Office of Keith Carson, horse and pony rides by the Black Cowboy Association, HIV testing by Cal Pep, and chess by Vets for Chess. Again, thank you to everyone who helped make the 2015 Friday Summer Nights at the Parks program a huge success. Hope to see you all at the parks next year!